Wildflowers at Pt. 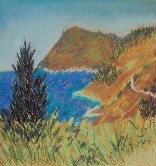 Reyes Original pastel painting on archival fine art paper. 23 x 19 professionally framed.